Abu Dhabi: Emirati doctors have inaugurated the first specialised clinic of Zayed Humanitarian Field Hospital (ZHFH) at the Rohingya refugee camp. The clinic is supervised by a number of senior consultants and specialists, and will provide diagnostic, treatment and preventive services for the refugees. Located in the camp for Rohingya refugees in Cox’s Bazar, Bangladesh, the UAE Doctors’ specialist clinics programme is the first initiative of its kind. Reem Othman, humanitarian work ambassador, said that a heart, chest and dermatology clinic was opened at ZHFH, and that more specialised clinics will soon be opened under the supervision of visiting specialists according to an operational plan that contributes to finding a realistic solution for the health issues suffered by Rohingya refugees. Othamn said that Emirati doctors have presented a distinguished model for volunteer medical work, and in a short period of time were able to operate a field hospital with advanced medical equipment to treat more than 12,000 children and elderly people suffering from contagious and chronic diseases. 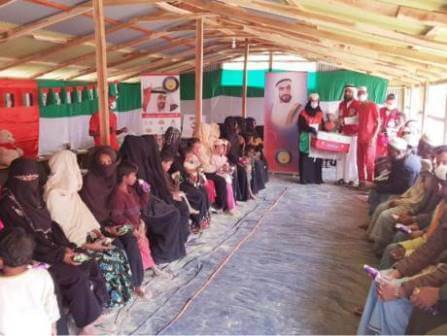 Emirati heart surgeon Dr Adel Al Shamri, chief executive officer of the Zayed Giving Initiative, said the hospital’s operations come within the framework of volunteer work by UAE humanitarian institutions to assist Rohingya refugees in Bangladesh.